We didn’t expect to take so long to reach Kota Bharu (also spelt as Kota Bahru and Kota Baru) – the capital of Kelantan – the north eastern state of Peninsular Malaysia bordering Thailand. We started our journey at 8 am after a dim sum breakfast in Penang. We embarked on to Butterworth Kulim Expressway then to East West Highway. We stopped by in Gerik town for a break: both toilet and snack. The road after Gerik is winding as we cut through the “backbone” of Peninsular Malaysia. I don’t like the road a bit. The road is so winding that it can make you sick. However here you can find roadsigns you can’t find elsewhere. Apart from mountainous views, one can see the huge Temmengor Lake. We headed to Jeli, Kelantan from Gerik. By the time we reached Kota Bharu, it was 3 pm. Everyone’s stomach was growling. 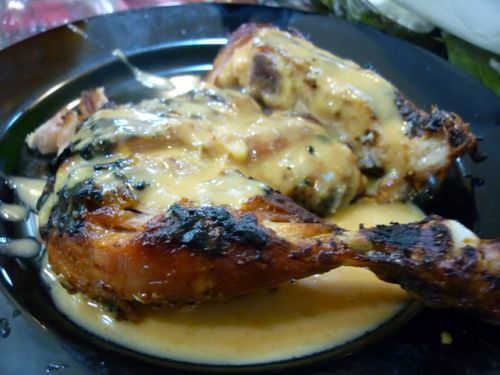 This talked-about restaurant is located along Jalan Long Yunus. With the help of GPS, we managed to find this eatery without problems. Upon arrival, we quickly grabbed a seat in the air-conditioned area and take a quick breather before enjoying the meal. We ordered some ayam percik, kerutup daging (a type of beef curry), and of course the not to be missed nasi kerabu (RM1.80 a plate). The nasi kerabu is awesome. 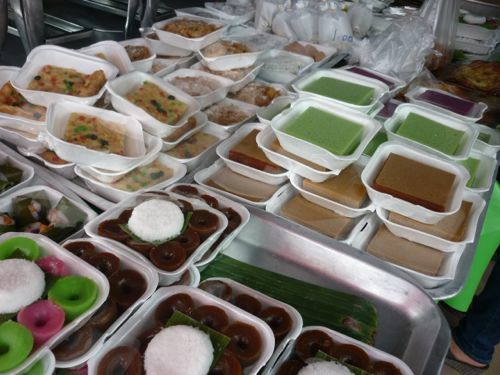 Also popular are gulai kawah and pulut panggang (grilled glutinous rice). 847 Jalan Long Yunus (Jalan Pekeliling), 15200 Kota Bharu, Kelantan. We deviated from the normal path. We didn’t stay at a hotel in Kota Bharu. I took a plunge to try out this Malay-run homestead for the first time. Besides to save a few bucks, the only reason I took it up because it looks like a clean and tidy place – from the photos on the website. I hardly trust what I see but for this, I felt Kayumas Homestay was worth a try. When I called up, the friendly owner Encik Rahim warned us that the homestay is located within a Malay village and asked me if it was a concern for me. I replied it is not if the villagers welcomed me. From financial point of view, the homestay is the steal of the decade. We paid only RM75 a night (instead of the normal rate RM80) as we took up two rooms for two nights. No booking fees are required and you only need to pay in full upon check-in. 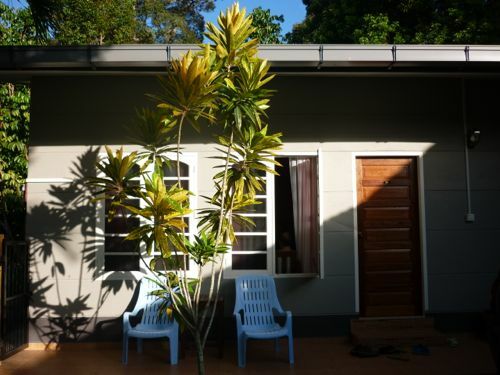 The accommodation is located next to the owner’s house – which is surrounded by orchard and animal farm. 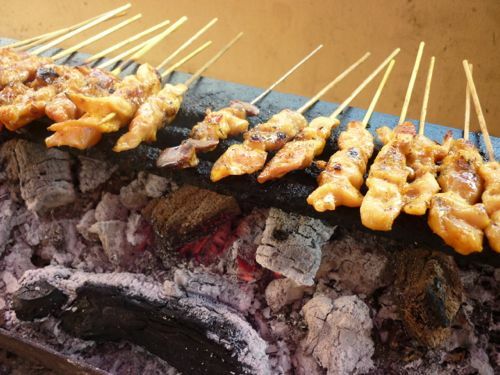 A nice place for those who want to have a taste of a typical Malay kampung life. We were given two connecting rooms. J and K could roam around between the two rooms. A simple breakfast of egg sandwiches was included as part of the package. The only concern is the homestay doesn’t have basins for patrons to wash face and hands. A bit inconvenient for us who are used to having basins for daily hygiene purposes. 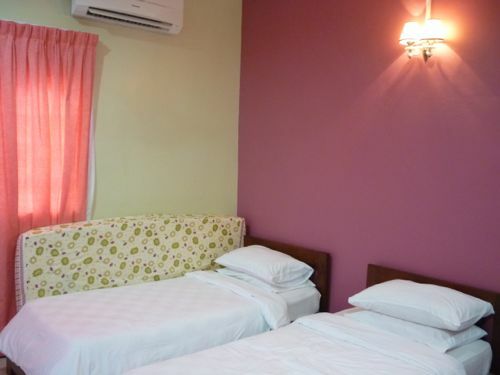 Otherwise, the homestay is generally okay but don’t expect daily house keeping with this price. Address: Lot 1511, Lorong Surau kota 2, 15100 Kota Bharu, Kelantan. I couldn’t imagine what would happen if we didn’t borrow the GPS for this trip. Even though I have done my research before hand, we still had problems finding a place for a decent dinner, especially Chinese food in downtown Kota Bharu. After touring around the town and ended up with nothing, I let the GPS be my dinner guide. We ended at a kopitiam (cafe) but that was not what we wanted. But nearby the cafe, we saw a Thai restaurant with a passable number of patrons in it. We settled down on that. It’s called Seri Chengmai Restaurant. We ordered its dinner set for 3-4 persons. We could choose any 4 dishes from the menu. The food was average and I didn’t quite like it as all dishes tasted very sweet. The set dinner was priced at RM68. Rice was not included in the set. The restaurant is owned by Chinese but many Malays are hired as waiters and waitresses. This is hardly found in other states in Malaysia. We wanted to bring the kids to watch wayang kulit live. After dinner, we wanted to catch live of what we have only seen on TV or magazines: the wayang kulit (puppet shadow play) at Gelanggang Seni. Wayang kulit is an ancient form of theatre by using puppets, lights and shadow. A story is told by moving the puppets in front of a light to form shadow on the screen. Audience will enjoy what is shown on the screen accompanied by live music. The map on our GPS is not the latest and since then road directions have changed for some streets in Kota Bharu. We had trouble finding the place. To make things worse, there is no proper signage at Gelanggang Seni, especially at night – which is hardly seen without proper lighting. How would you expect tourists to find this place? We missed the place 3 times because of poor lighting and poor signage. If it’s not that I happened to stop at the roadside near the entrance to check out the place, we would have missed it again and our efforts to locate the place of interest would have been futile. Luckily when we reached the stage for wayang kulit – which is located behind the main building, the show had not really started. Only music was being performed. There we had a good close look at the dying art. My wife has a good idea on how to further promote the ancient art. Put subtitles in Malay and English so that tourists can better understand what story is being told in wayang kulit. The narration of Tok Dalang is not apprehensive even though you are fluent in Malay. Hence even locals need help in understanding the story being told. Jalan Mahmud, Kota Bharu, Kelantan. Note: Call to verify events to avoid disappointment. Here is another famous old coffee shop. How could we miss it? It is white but not as grand as the White House in the US. By the time we reached, the place was already packed with customers. We waited for a while to get a place to sit down. The kopitiam which is located next to the Sultan Ismail Petra Arch and Istana Jahar is a living testimonial where it reflects the true spirit of Malaysia. There you have people from all races having their meals under one roof. 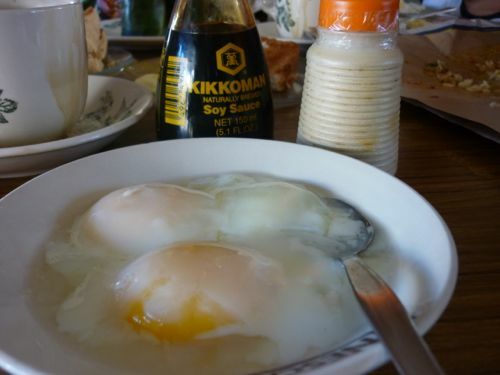 White House Kopitiam is famous for its local coffee, toast, half-boiled eggs. 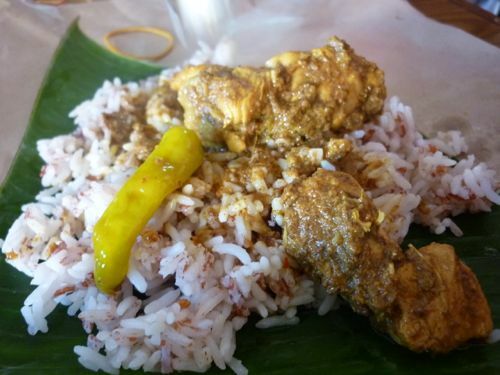 You can also enjoy their packed nasi berlauk, nasi dagang, and more. We almost missed the place as the view was blocked by a row of makeshift stalls in front of the coffee shop. And the shop is relatively small compared to huge buildings in the vicinity. We chatted with the friendly 70+ Chinese owner (who is still actively being a cashier) and he shared with us that his Hainanese wife makes the kaya – which is not available elsewhere. If you have not enough, you can take home some kaya – available in two volumes – 500g for RM8. Coffee powder is also for sale at RM15/kg. 1329-L, Jalan Sultanah Zainab, Kota Bharu. It is kind of weird a market is a place of interest for tourists. But somehow people say markets are the true reflection of how locals conduct their lives. Not far from White House Kopitiam, Siti Khadijah Market is not something you can’t miss easily due to its size and crowds. There are three floors altogether. 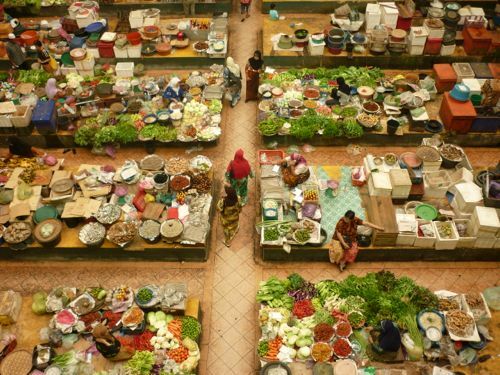 The lowest floor houses the wet market where fresh produce like fruits and vegetables, poultry are sold. One obvious feature is the peddlers are all women. They sell by sitting down… on elevated floor. The law enforcement team must buck up. 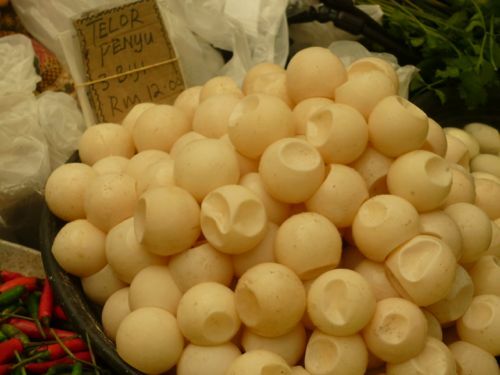 Though it is illegal, there are many sellers are selling turtle eggs in the open. Second floor is for people who are looking for dried foodstuff such as the popular keropok ikan, cashew nuts, pistachios, salted fish, etc. On the highest floor, clothing forms the main products there. There are many museums in Kota Bharu and we only picked Istana Jahar for our trip. Reason? 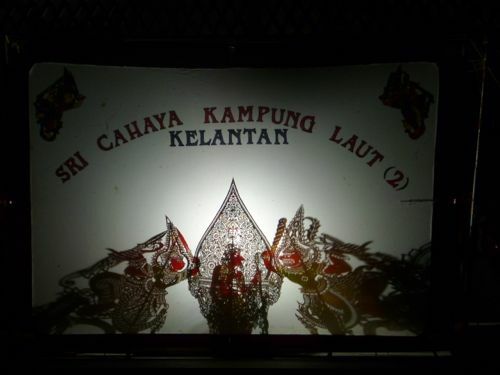 It’s easiest to find and it is unique as it is about Kelantan’s royal family’s rituals and traditions. Later we realized Istana Jahar was built in 1855 by Sultan Mahmud II for his grandson, Long Kundur. It was a royal residence but now Istana Jahar has turned into a museum. It has intricate woodmanship that reflects the Malay architecture. 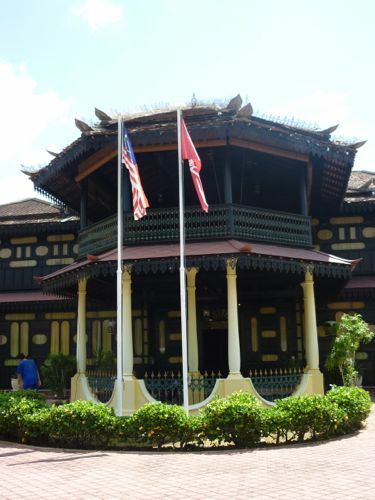 The royal museum houses artifacts, photos, costumes, weaponry, utensils used by the Kelantanese royal family. There are many museums that are located near Istana Jahar including Istana Balai Besar. Entrance fees: RM1.50 for adults and RM1.00 for children of 10 and up. The weather was scorching hot. We wanted to find cendol to cool off the day. But based on the GPS coordinates we had, we failed to locate the famous cendol stall even after several attempts. In the last try, we ended up at Jalan Seri Cemerlang. I remembered that a coffee shop my wife’s colleague recommended is somewhere along this road. I quickly looked it up in our itinerary and true enough, that was the coffee shop. It is called Kopitiam Kita. 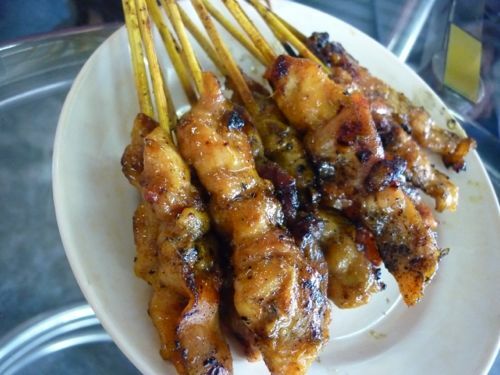 What is famous here is the satay. We ordered 30 sticks (RM0.60 / stick) and one roti telur (RM1.70) for the kids. We saw something new on the menu and wanted to try. 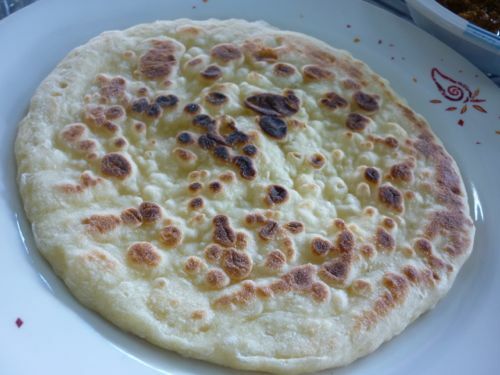 It’s similar to naan and it’s called roti hayat (RM3.50) and it comes with curry of your choice as the dip. What makes the no-frills coffee shop unique is the owner hangs a series of pictures of people who patronized the place. From police officers to bank managers, from people on the street to royal family members. An uncommon way to decorate the wall indeed. Jalan Seri Cemerlang, Kota Bharu. Still not wanted to give up, we continued our search for cendol. After asking the satay seller at Kopitiam Kita and people on the street, we found one common place locals go for their cendol fix: a roadside stall near the stadium and opposite Perdana Specialists Hospital. Living up with its popularity, the stall is packed with people. We ordered 2 bowls of cendol. Their version of cendol is different from what we have in Klang Valley or Penang. 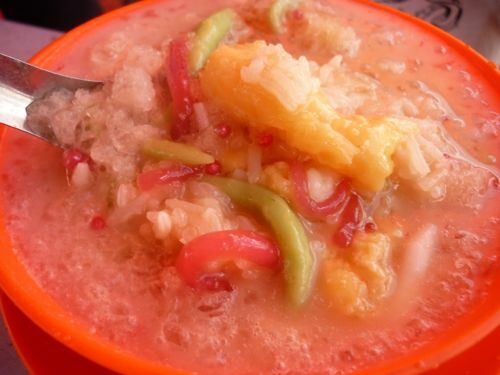 It is called cendol pulut tapai or CPT for short. 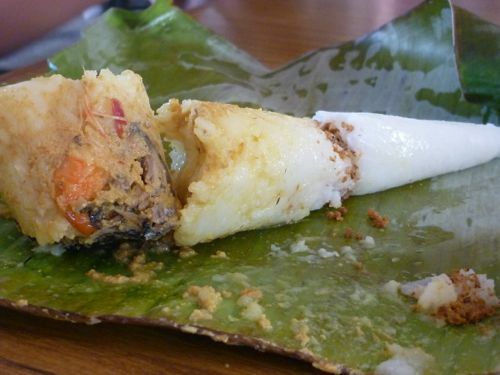 Besides the normal ingredients we have, there are something extra such as tapai – fermented tapioca. 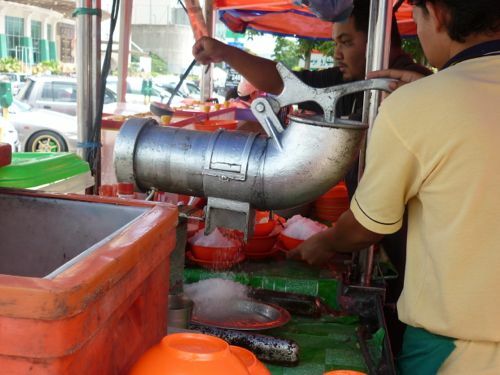 My wife and parents-in-law don’t like this type of cendol. In the end, K and I had to finish it all. Although I prefer the “normal” cendol, I can still take CPT. Opposite Perdana Specialists Hospital. Next to tennis courts of Stadium Sultan Mohammad IV. 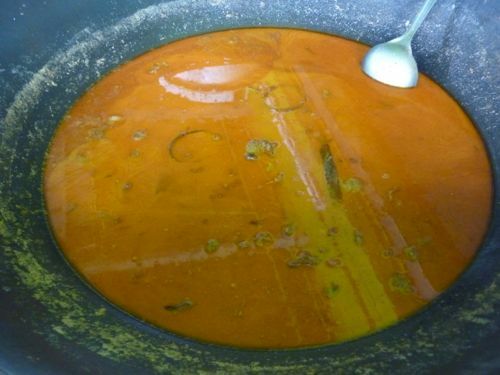 Price: RM2.00 / bowl. Plain Cendol is also available – RM1.00. After exploring Kota Bharu a bit, we continued our trip to Tumpat – town which is about 30 minutes from the Kelantan capital. Under the influence of Thailand, there are many Buddhists in this area and it is not surprising to see Buddhist temples here too. The first we went to was Wat Pothivihan, the sleeping or declining Buddha. 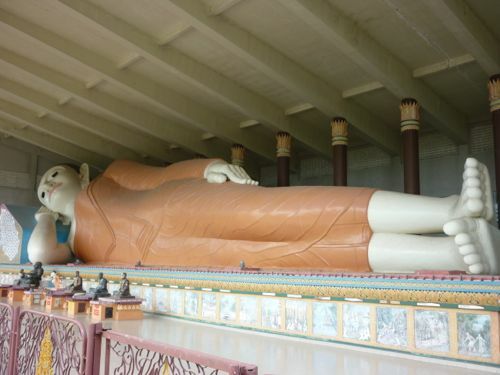 The 40m long Buddha is claimed to be the second largest in South East Asia. The statue is covered by a roof only and I don’t mean to sound impolite, the statue of Buddha is not well maintained as one can see it is covered with dust. 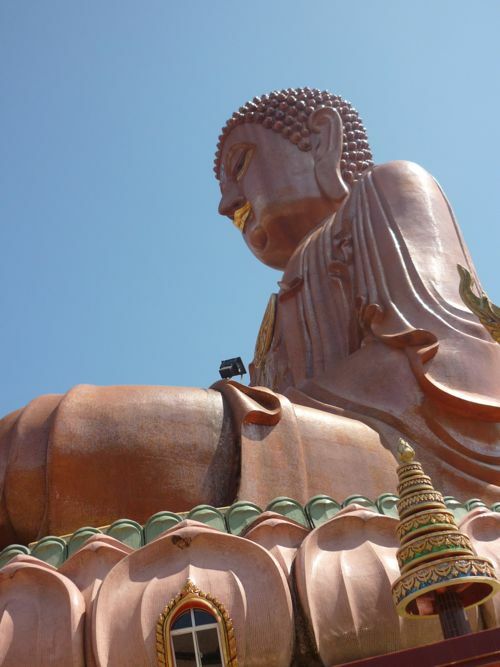 After visiting the sleeping Buddha, we proceeded to the sitting Buddha – Wat Machimaram. Contrary to what we saw, this temple is better maintained. We took a quick tour there before heading to Tumpat for a quick drive. 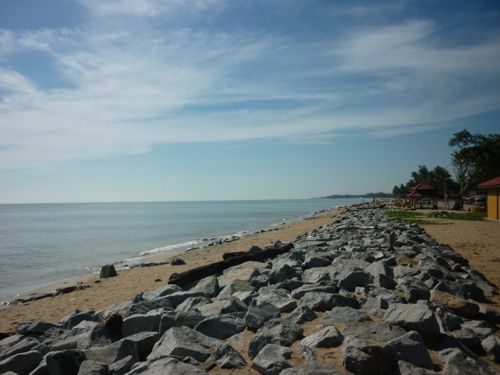 But before we went to Tumpat, we stopped by at Pantai Seri Tujuh – one of the popular beaches in Kelantan. But to our dismay, though the beach is unique with 7 lagoons surrounded it and big trees lining the beach, the beach is not well maintained and dirty. While on the way to Tumpat town, we saw another temple (which I didn’t plan to go initially). 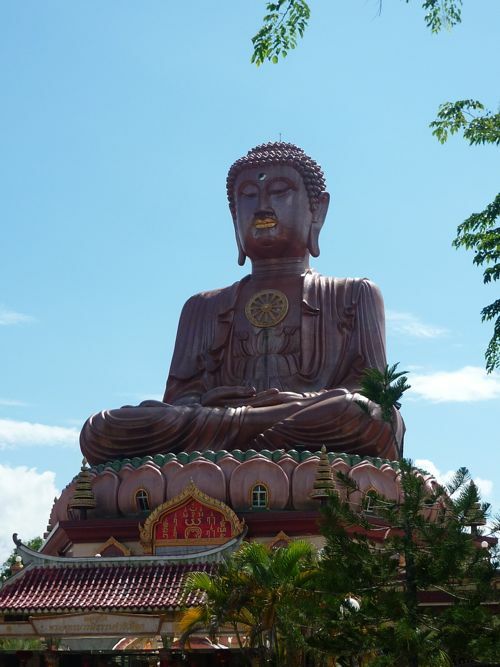 Since I bumped into it by accident, after visiting the town which is rather modest and humble with just a few rows of old houses, we made a quick stop at the standing Buddha temple. The temple is called Wat Mai Suwan Khiri. 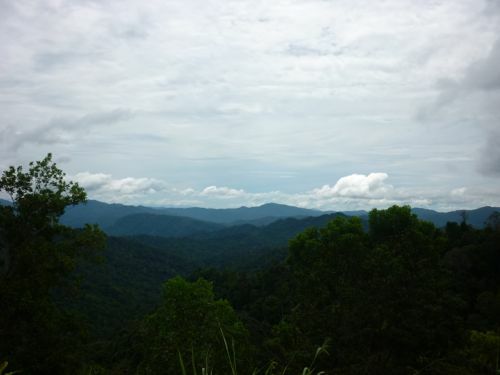 It is located on the outskirt of Tumpat town. We had a hard time locating this famous restaurant. Though armed with GPS, we were not sure where to turn as the Thai restaurant is located in a small village called Kampung Kulim. Nothing beats the old fashioned method. I pulled over and asked a local fishmonger. Of course he never heard of the restaurant and I guess it is only popular among tourists. But when I mentioned Kampung Kulim, he immediately knew where the place was. We were lucky as where he pointed us to was correct. 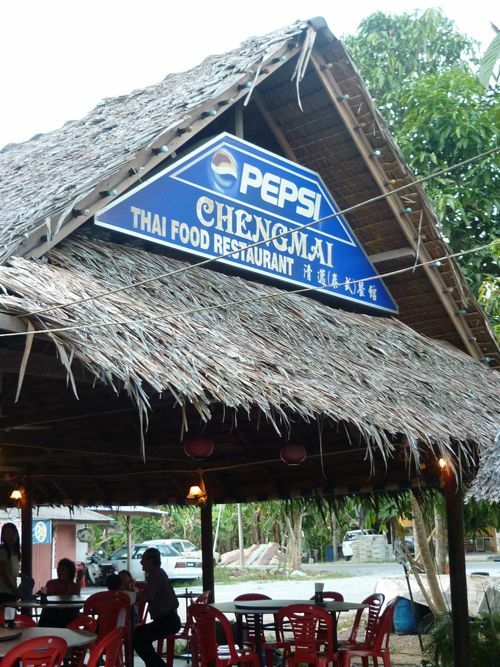 Chengmai Thai Restaurant is located in the inner part of the village. In fact, it is not the only restaurant there. While we were there, we saw at least five restaurants there. Of we knew what to order as we already researched about the restaurant before we came here. 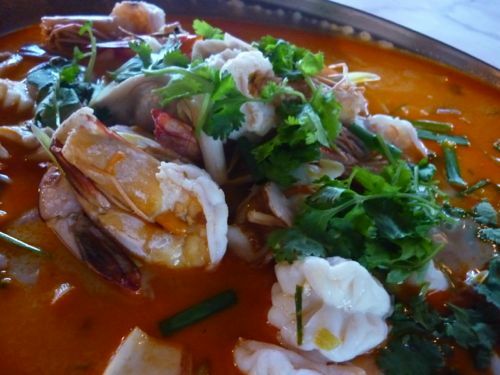 Above all, my top favorite dish was the chili prawns in coconut milk (something like red tomyam). Succulent, fresh, and not to mention big. Next on the list was pork knuckle. My father-in-law loved it very much. It’s crispy on the outside and tender on the inside. Two other dishes we ordered were mango salad and tofu which were just average. We find the mango was too hard. We expected this meal to be expensive but not as expensive, especially the pork knuckle! But again what do you expect from a touristy place like this? Total damage was RM117. Coconut prawns RM40, pork knuckle RM46. Next time if we are there, we will try out another restaurant called Ban Kok, before Chengmai. We noticed that many local cars parked outside the restaurant. 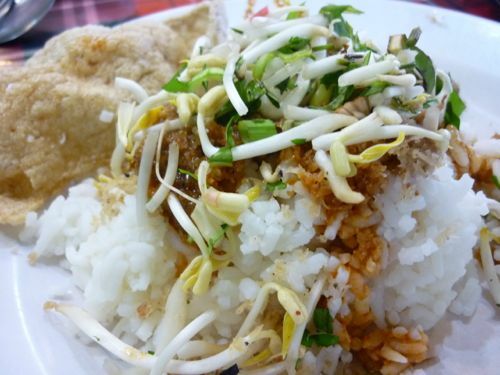 Located not far from the Grand Riverview Hotel, and in a modest coffee shop, hidden is a popular nasi dagand stall run by a Chinese couple. 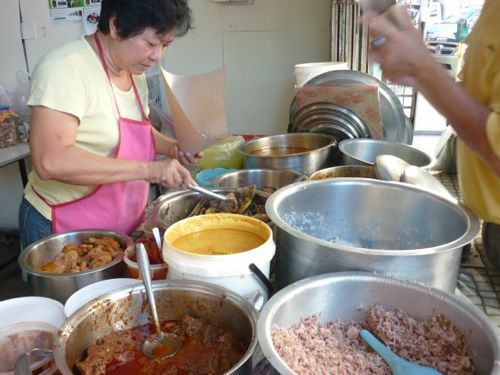 Judging from the queue, you will know this stall is famous and they are mostly locals. You have to queue up to make your order. They only serve in takeaway packets. 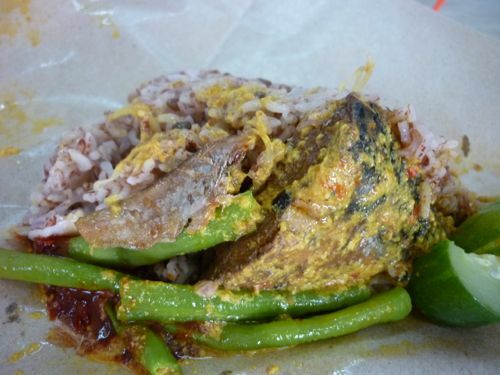 But you can enjoy your nasi dagang at the coffee shop. Not only do you have to wait for the lady to take your order and pack your rice, you have to also wait for your drink for long. Why? Because the kopitiam owner handles everything from taking orders to preparing drinks. Albeit a lady helps him with the cleaning. If you are an impatient person like me, it will be better to pack and eat somewhere else. After our nasi dagang breakfast, we went to Pantai Cahaya Bulan or popularly known as PCB or formerly known as Pantai Cinta Berahi. Again there is nothing to shout about. The beach is not visitor friendly as there are many rocks stacked up as barrier. By the time we were there, it was about noon and the weather was too hot to stroll at the beach. Now that we had had enough of Kota Bharu, our next destination was Rantau Panjang – where it is about 30 minutes’ drive away. I heard that this border town is a shopper’s paradise of cheap Thai products, so a visit there was a must. You can still find wooden shophouses in Rantau Panjang. And I have to say this, despite it’s status of a shopping area, the town is messy and disorganized. The roads in the heart of the town are just too narrow for the amount of traffic. The traffic is very heavy especially on weekends. If you want to buy things here, here is a tip for you: Haggle as much as you can. The products here are slightly cheaper here compared to other places. Things you can buy here include clothes and food (cashew nuts, pistachios, peanuts, etc). My wife has got a polo T-shirt for RM18. J and K got a piece of their favorite dress and t-shirt respectively for RM15 each. 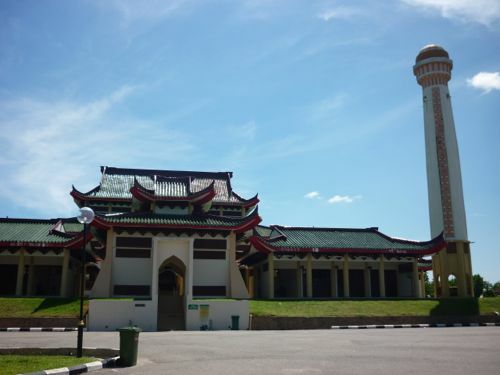 Another reason we came here was to look for a mosque with Chinese architecture – a rare sight in Malaysia. It’s even more intriguing to find it in an Islamic state of Kelantan. We didn’t have trouble finding it. The mosque is Masjid Jubli Perak. We liked the pineapples we bought the other day so much that we bought again at one of the roadstalls on the way out of Rantau Panjang.